Your Pictures are just lovely I can't wait for the snow...I know...a silly newbie! I will be posting panic on here im sure come October! Isn't it something what people will do? We took a trip to Yellowstone. The bison were right by the road. Of coarse people were stopping and looking at them, then moving on. Would you believe some were getting out to take pictures? Even letting little kids out of the cars. Signs all over the place about people getting gored. Sometimes I wonder if they forgot to pack their brains! People need to read and heed the warnings. They're not stuffed animals. Probably right next to south Nevada wouldn't be so good. Last time I was in the area my son and I saw a couple of homeless-looking guys walking around and one was openly carrying and swinging - an ax! The security people at a grocery store there where they stopped had talked to him and I guess he was carrying it for his own protection. Still made me nervous. But I don't think there is much more crime in the residential areas around there than anywhere else, my daughter used to live in the area. Yes, we were in Yellowstone in SEP 2005 and got the attached picture. We stayed in the car, with windows closed. As it is in our sub-div, we've seen rabbits, foxes, pronghorns and coyotes. Three weeks ago, the day we arrived here we were in a motel on South Navada DONT LAUGH.....We really did not know the area and we only spent one night there but long story short our lap top case was taken! Inside was a laptop, 2 blue tooth devices and alot of other personal stuff....We reported it to the police but so far nothing. We did check out the local pawn shops but it so far has not turned up there. We call and act as if we are buying a laptop.....IT was our fault. We drove all night and left the case in the motel computer room, which is somthing we never do! Its funny. A mile south / west of South Nevada is million dollar homes. Wow, thanks for the info on S. Nevada. Now I understand why he said that. No offense, but I'll probably steer away from that zip, since I'll be living alone. I don't want to be near a bad area at all. Like Nadine and MDZ said, wildlife can be harmful. Stay in your car or house if potentially dangerous critters are near. Don't tempt fate. 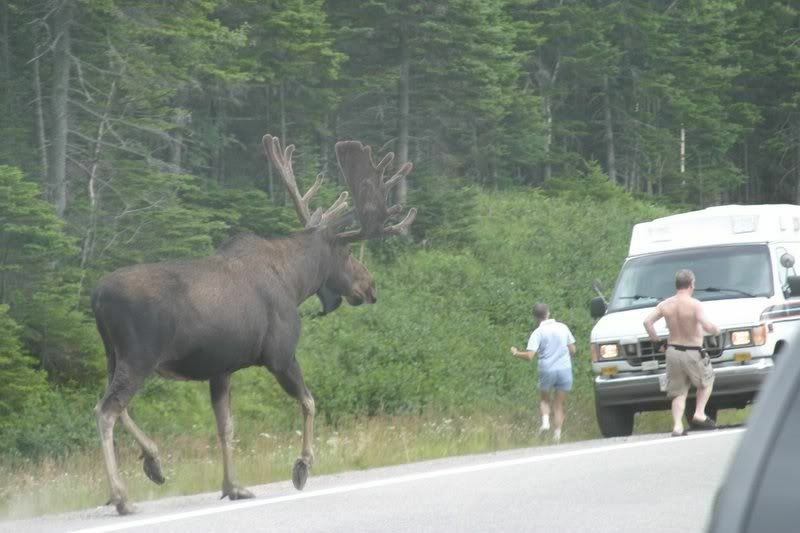 The following picture of a Moose is probably from Canada. Mike - you are so knowledgable and hysterical! Love the pic!